Erosion Protection Systems (EPS) is an internationally recognised company specialising in the supply and installation of grout filled revetment mattress products for erosion control and flood repair works. With 30 years of experience in this field, we offer a history of knowledge and engineering expertise unmatched by our competitors, both in Australia and overseas. The products provide a cost effective alternative to the traditional methods that include stone pitching, sand bags, gabions, rock mattresses, reinforced concrete and rip rap protection. 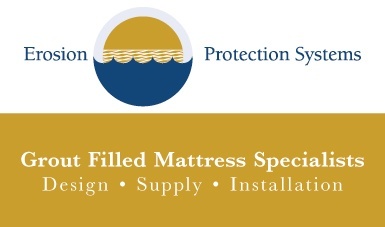 In comparison to the above methods of flood protection, the fabric formed mattress products offer significant cost savings and are readily installed under water. The unparalleled speed of installation allows for the fast tracking of large-scale projects, thus providing additional costs savings for project managers and clients alike. The products can also be coloured to blend in with their natural environment. We were involved with the design, supply and installation of 6000 square metres of flexible block mattress to the embankments of the North Esk River, adjacent to the city of Launceston in Tasmania. The mattress extended out 20 metres into a tidal river, with the mainly underwater sections installed using divers. Despite some challenges with high river flows during construction, the project was completed on time and budget, with the Flood Authority pleased with the final outcome.